Built to be comparable to the Maytag UKF7003 refrigerator water filter, this comparable replacement by Swift Green (model SGF-M07) will maintain or improve the taste of water dispensed by your fridge throughout its lifespan. Significantly reduces chlorine, particulates, and odors, and meets NSF standard 42 for contaminant reduction. Maintains great taste throughout its life! 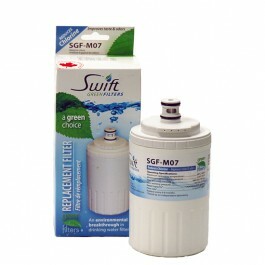 The SWIFT-SGF-M07 does not reduce fluoride.